One of the most intriguing optics on the Canon RF lens roadmap is the Canon RF 85mm f/1.2L USM DS – the DS standing for 'Defocus Smoothing'. Now it looks like Canon is working on a DS lens for its EF-mount system, thanks to a patent for a new EF 50mm f/1.4 optic. So what is a Defocus Smoothing lens? A spiritual successor to Canon's earlier Softfocus lens, Canon's Product Intelligence Consultant, David Parry, explained it thusly: "Using different lens elements, it will give a different look to foreground and background blur and a much smoother look to the bokeh effect. And that will change with aperture as well, so you'll be able to get different degrees of effect on that depending on what aperture you're using." In a recent interview with DP Review, Canon's Japanese engineers revealed that this defocusing is achieved using an apodization effect. This is accomplished via the introduction of an additional optical element that creates a smooth, Gaussian-like dispersion of the gradation towards the edges of lens elements – which in turn reduces the harshness at the edges of characteristics such as 'bokeh balls'. 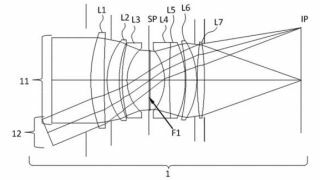 And, as unearthed by Canon News, Japanese patent JP,2019-056780,A describes a new 52.43mm f/1.49 lens for the EF mount with just such an apodization element. "Generally, in the medium telephoto imaging lens system from the wide-angle, sagittal halo of off-axis light beam causes uneven intensity of defocus image at the image peripheral portion. For this reason, it is possible to improve the appearance of an out-of-focus image in an off-axis light flux by providing the light flux with a transmittance distribution by the apodization filter and effectively removing the sagittal halo." Part of the apodization process is that it reduces light transmission, delivering an effectively lower t-stop than the f-stop would indicate, as the patent continues: "At that time, effective removal of the sagittal halo while suppressing the decrease in light quantity is required as the performance of the apodization filter." So, Canon has patented a new EF-mount lens with the same apodization effect as that seen in its upcoming RF 85mm DS (which could well be one of the best Canon lenses). Is it fair to conclude that this is the start of a new Defocus Smoothing line of Canon lenses? The company certainly patents far more tech than ever sees the light of day, but a continued commitment to its EF mount optics – not to mention an inclination towards more artistic lenses – would be very welcome indeed.